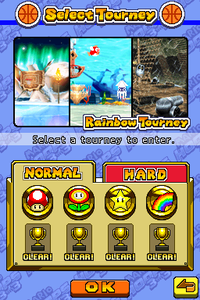 The Rainbow Tourney is the fourth and final tournament in the game Mario Hoops 3-on-3. It can be unlocked by completing the Star Tourney. This tournament is played on Sherbet Land, Bloocheep Sea, Pirate Ship and Rainbow Ship. There are two difficulties of the Rainbow Tourney; normal and hard. In each one, the prize can be either bronze, silver, or gold. Clearing normal Rainbow Tourney unlocks hard mode for all tourneys. Ninja – Complete normal Rainbow Tourney with a bronze prize or higher. White Mage – Complete normal Rainbow Tourney with a silver prize or higher. Black Mage – Complete normal Rainbow Tourney with a gold prize. Hardest CPU difficulty – Complete hard Rainbow Tourney. Black Mage alternate costume – Complete hard Rainbow Tourney with a bronze prize or higher. Ninja alternate costume – Complete hard Rainbow Tourney with a silver prize or higher. White Mage alternate costume – Complete hard Rainbow Tourney with a gold prize. Mario • Luigi • Princess Peach • Princess Daisy • Yoshi • Wario • Waluigi • Donkey Kong • Diddy Kong • Bowser Jr. This page was last edited on June 27, 2018, at 15:13.